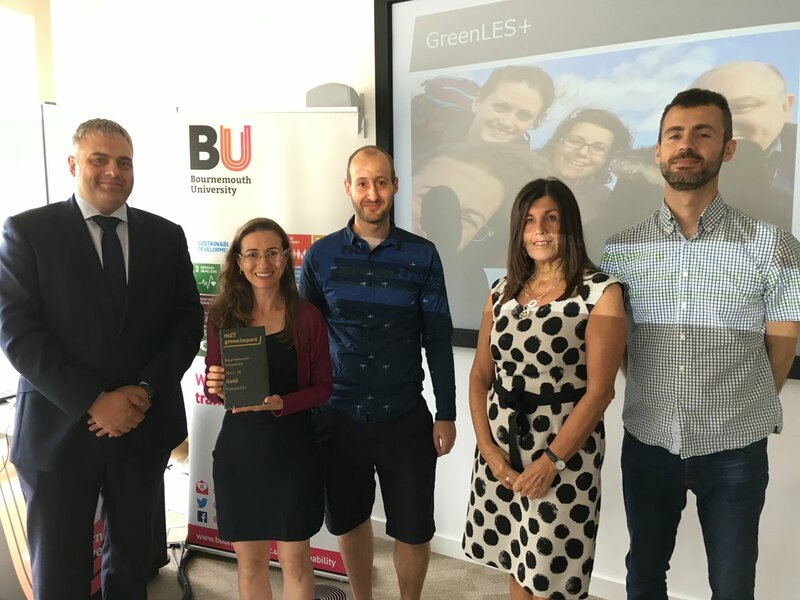 BU’s Department of Life and Environmental Science (LES) has received a Gold award for Green Impact, after taking part in the Green Impact challenge back in 2015. Green Impact Universities and Colleges is an environmental accreditation and awards scheme delivered by the NUS, in partnership with the Environmental Association for Universities and Colleges (EAUC). It aims to empower people and their departments to take action on sustainability and reward them for their environmental efforts within their workplace. The award covers measurable actions relating to topics around sustainability – including communication, travel, recycling, and energy – and the number of actions completed correlates to a Bronze, Silver or Gold Award. Main activities included promoting the opportunities that BU offers staff to enhance sustainability, such as water saving, Green Week, and sustainable travel; and the identification and documentation of the five most significant negative environmental impacts and suggestions for solutions in the coming year. We would like to congratulate the team and the department on this for their hard work and persistence over the last 4 years. ‘Poole Harbour provides both for a diverse ecology and a productive maritime economy. The Harbour is exceptional in the extent to which it illustrates the interface between environment and economics in the coastal zones of North West Europe. Positioned at the eastern end of the “Jurassic Coast” World Heritage Site, the entire Harbour has various conservation designations while at the same time providing for commercial shipping, motor yacht manufacture, fishing & aquaculture, tourism, a military base, and a range of other significant maritime industries. It also lies over an oil field, receives effluent from both a large conurbation and an agricultural catchment, and supports a variety of recreational activities, not least sailing and angling. These features along with the intensity with which they interact make Poole Harbour a powerful case study for the elucidation of sustainable development in practice. Thirteen years ago the Poole Harbour Study Group held a conference which resulted in the book The Ecology of Poole Harbour. This 2018 conference aims to expand the scope of that and last year’s Marine Protected Areas conference, by examining the relationship between the environment and the economy which it supports. The conference is part of the Poole Maritime Festival and among the events during the day Borough of Poole council will present key findings from their forthcoming marine supply chain mapping report. For further general information please contact the Conference Secretary Dr Alice Hall A.Hall@bournemouth.ac.uk. To submit, a presentation or poster proposal, please send a 50 word summary to PHSG Chair, John Humphreys (email jhc@jhc.co), who would also be happy to provide advice on any early stage presentation idea. Sir David Attenborough has stated that he is more encouraged about the future health of the Earth. This is due to a “worldwide shift” in attitudes about concern for the natural world and the damage humans are causing.